We use electricity at home for almost everything we do every single day of our lives. We barely give it a thought as we plug in an appliance or switch on a light. It is without a safety care that we watch kids play with gaming systems and tap away on our tablets. It has become such a mundane part of our lives that it can be easy to forget just how important electrical safety at home can be. With that in mind we encourage you to take a moment to think about energy safety and what you can do in your home. When a lot of older homes were built there was simply not as much to plug in. Therefore there may be only one or two electrical sockets per room. Fast-forward to today and there are endless items that run on electricity such as lamps, televisions, computers, cordless phones, etc. It can be tempting to use power strips and extension cords to plug everything in at once. Don't do it. Choose what you really need to use wisely and never overload outlets. This can prevent outages and potential fires. Tip: High quality power strips often come with surge breakers, which stop overloaded sockets from tripping the breaker. When you are arranging your furniture make sure that you can access all the power sockets. This will make it not only easier to turn them off (saving money on your power bill) but also make it far easier to keep the various leads tucked out of the way. Children running around the home can easily catch their feet on power leads. Keep them secure with a plastic tie or a clip to prevent trip and fall hazards. You just plugged in your iron and you hear a little "buzz" from the outlet. Don't just shrug this off. It could mean there is a major problem with this outlet. Turn the socket off at the wall first and then unplug your appliance. Call an electrician before you use it again. Letting it run with power unchecked can be a fire hazard or cause major damage to your electrical system. If you have children at home, you need to think seriously about electricity safety for kids. The chances are you have likely already given your house a once-over safety check. However, if you have grandchildren or nieces and nephews that only stop by once in a while you may not have given it much thought. Kids can move at lightning speed and find trouble in incredible places. To protect your favourite little people invest in plastic power socket covers and make sure that cords are out of reach. Also ensure that appliances such as lamps and TV's are anchored properly so that curious hands cannot pull them off their stands. If you have just moved to New Zealand you may have a cupboard full of your beloved small appliances that you plan to use with a converter plug. Not all of these converter plugs are created equal and some are just not able to handle the currents here. Proceed with caution when plugging them in and do not leave them unattended. Not only could your ruin your electronics you can cause some serious havoc on your power system. When you are beginning a DIY project first look up and then down. Power lines can be easily overlooked so do a double-check before you trim a limb, dig a hole or climb a ladder. Tip: you can use the free ‘Before U Dig ' service to access information about underground pipes and cables. If you are renting your home you may not be immediately familiar with the ins and outs of the electrical system. Pay attention when you plug in. If something is tripping the power off or causing plugs to overheat then this needs immediate attention. Call your landlord if you suspect a problem – both you and the owner will be glad you did. It will keep you safe and prevent possible damage to the property. If you are trying to fix an electrical device yourself there is one rule that will always hold true. NEVER cut the third prong off an electric plug. Doing so can compromise the safety and integrity of the item. Only use light bulbs with the correct wattage assigned for a particular lamp or fixture. If there is no indication on the product, do not use a bulb higher than 60 watts. A little forethought goes a long way in keeping your home and family safe. Take some time to walk around your place looking for hazards that may have escaped your attention. We want Genesis customers to be informed and smart about how they use their power. What tips do you have for making the home a safer place for your family? Smelling gas? It could be a leak. What should you do? In case of an emergency, please contact us immediately. Residential Customers: 0800 300 400 Business Customers: 0800 600 900 24 hours a day, 7 days a week. 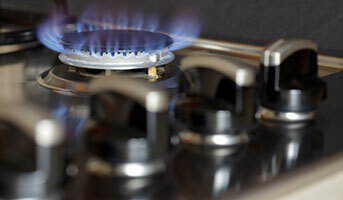 Using natural gas is a safe & economical option for cooking & heating your water, but would you know what to do if you smelled gas in your home?